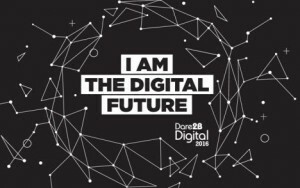 The countdown is on to the now SOLD OUT Dare 2B Digital Conference & Innovation Challenge Sat., Feb. 27th. Already registered? Here are final ta-da’s and to-do’s for your perfect day. We’ve had a phenomenal response and expect record attendance, so reserved seats are a very hot commodity! Forgot to register? The 2016 conference is sold-out and we will not be able to accommodate new walk-in registration on the day of the conference due to space limitations. We invite you to enter a team in our Innovation Challenge this Spring and catch our next event, the Dare 2B Digital Red Carpet Innovation Celebration, on April 7th at MetroED in San Jose. Sign-up for updates on these programs. All Student and Adult attendees must sign a release for admission to the conference. To expedite your registration, we strongly suggest downloading and printing now and bringing your signed forms to registration on Saturday. Students not accompanied by a parent/legal guardian must bring a signed release to registration. Student releases must be signed by parents/legal guardians.Oracle Release is only required for students who plan to attend the Oracle workshop. Pre-registered and confirmed conference attendees may pick-up their conference badge at the registration area on the 1st floor of the PayPal Town Hall building. Look for signs and volunteers to guide you. Check-in is by LAST name. Name tags must be worn at all times for security purposes. Student workshops are not pre-assigned this year. Workshops are first-come, first-served and repeat at 10:45 and 1:30 so you have opportunities to attend workshops of interest in the morning and afternoon. Plan ahead. Browse our line-up of workshops. Dare 2B Digital is about learning, creating and connecting. From rockets to a private rock concert, our speakers, sponsors, staff, advisers and volunteers have put together an incredibly fun day for you. Get social…tell us why you’re jazzed! Tweet, Instagram and Facebook your favorite tips, speakers and quotes. Selfies, ussies, videos – tag #Dare2BDigital. We’ll shout them out! Can’t wait to STEAM with you at #Dare2BDigital 2016!